About 4 months ago, I made a radical change for our family. 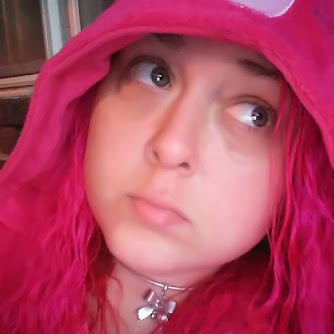 As I have spoken about, I've been on a weight loss journey since November of 2014 and have lost about 50 pounds to date. Initially I just cut out fried and fast food and regular soda but overall still ate the same things, just in smaller portion. This worked, but I still wasn't FEELING better, and I felt like I was missing the mark somewhere. I knew a lot about nutrition and the benefits of eating organic from my time as a vegan (which is another story for another post! ), but wasn't actively eating all organic and the selection at the regular store was okay but not great. I watched several Ted talks about the benefits of eating locally and did some of my own research online and decided that while the apple at the regular grocery store may be organic, if it was coming from thousands of miles away by the time I bought it, most of the nutritional value was gone anyway. I wanted to feel better and also feel like I was supporting small local business. I wanted to be an active part of helping make our community better. So, I looked at our regular grocery stores for local products- there was little if anything. I started shopping at the Farmer's Market, which was/is great, but it still didn't fill the need for a lot of the day to day products we need. Yes, I could truck it across town to Short Pump to go to Whole Foods but again, it doesn't fill our daily grocery needs. 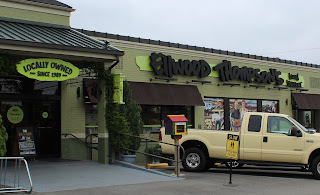 Ellwood's (Ellwood Thompson's) is the answer to all of our problems. It's locally owned and has been voted several years as the best store in Richmond for a REASON. Hence the name, it's located on the corner of Ellwood and Thompson in Carytown. Right out front, there's a Little Free Library, a community based free library. Holy produce you guys! It's basically an indoor farmer's market and is GORGEOUS! Just look at that veggie goodness! Come on y'all, you know that's some gorgeous produce! In the produce area, they have a handmade, local, and fermented section. Try the guacamole, it's literally the best I've ever had! Bulk dry goods anyone? 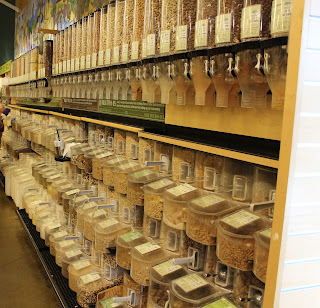 This is an obscenely large selection, and has options for about every kind of nut, grain, and granola you can think of! Local honey and bulk oil? Yes please! ^^^^^THIS is reason enough for me to support this store. You don't have to hunt for non-GMO products, it's all they carry in bulk bins and produce! Not sure why non-GMO is the way to go? Here's one article about why. and that's not what I support. Their personal care, (including products for babies/children) hygiene, and selection of essential oils is a huge convenience for me! They have a nice selection of local milk in glass bottles (and plenty in plastic jugs too!). Their cheese selection is massive, but the best thing is the case of locally made cheese. If you're a wine drinker, this is a great selection for such a small store! This meat selection is truly what made me fall in love with the store. Not only is it small, but they carry local meat. Don't expect to find the same thing twice either! When it comes to steaks, for example, one week you may find local rib eye and the next week only sirloin. You don't really know exactly what they will have but the prices are fair and the quality is out of this world. (Ask any of our friends who we have treated to a steak dinner what they thought, they'll tell you!) There are many things they will have every time you come, but if you are only buying local, the cuts will vary and change. This local food hub right by the exit just makes me happy. I didn't photograph every aisle (especially of the snacks, frozen, bakery, etc.) but I just wanted to give a good overview of why I love this store. I can't possibly say enough nice things, but if you live in or are visiting Richmond, please stop by and support this local gem! Hat's off to you, Ellwoods, for helping make RVA a healthier and more community conscious place! I wish we had one of these stores in Raleigh! I grew up eating organic and it really does make a difference in how you feel! Now that I'm living on my own I think I might switch back! Thanks for sharing! OMG...My husband would KILL ME if I found something like this! I love the look and idea. More places need to do this.